–Amen (“truly, “verily” It emphasized the truthfulness and divine origin of the message. -Ruler of God’s creation: (John 1:1-3, Col.1:15-17 Jesus is the originator of creation, He rules and sustains it with his powerful word. NO commendation to this church (v.15-16). We have learned that Jesus knows what goes on in the church. (v.15) “I know your deeds, that you are neither hot nor cold. I wish you were either one or the other! This is a metaphor from Laodicea’s water supply. Laodicea was located between two cities, Hierapolis to the north, which was known for its hot streams, which people thought contained healing properties. Then in the south Colossae was known for its cold, pure drinking water. (Show map). The water that came to Laodicea via the aqueduct was lukewarm, it contained impurities and people had to let it sit for a while before they could use it. Laodicea water didn’t contain the healing properties of Hierapolis, nor it was refreshing as the water at Colossae. The church was very much like the water that came to the city. Lukewarm, it will make you sick if you drank it. Jesus said to the church, because you are lukewarm, I will vomit you. -You are wretched, pitiful, poor, blind and naked. To Smyrna Jesus said, I know your poverty, yet you are rich. To Laodicea Jesus said, you think you are rich, but you are poor, miserable, pitiful, blind and naked. Instruction to this church (v.18) I counsel you to buy from me gold refined in the fire, so you can become rich and white clothes to wear, so you can cover your shameful nakedness, and salve for your eyes so you can see. The idea of gold refined by fire in scripture refers to a faith tested by suffering or persecution. (1 Pet.1:7), this gold refined by fired from Jesus cannot be bought, it must be accepted. White clothes to wear (white garments in Scriptures represent righteousness. This church cannot be righteous on its own, it needed to be dressed with the clothing of Jesus in order to cover the nakedness. This church’s view was not the same as Christ’s view. Jesus said the church was blind and needed to get medicine to fix her sight. Those whom I love I rebuke and discipline. (Hebrews 12:5-6. God disciplines those he loves and he punishes everyone he accepts as a son). Rebuke is the word for reproof or convicting you of the wrong you’ve done. Discipline is the word for training or instructing. It is being disciplined and rebuked that shows God truly loves us. Self-dependency and self-centeredness leads to alienation from God. What does Jesus expect of his church? 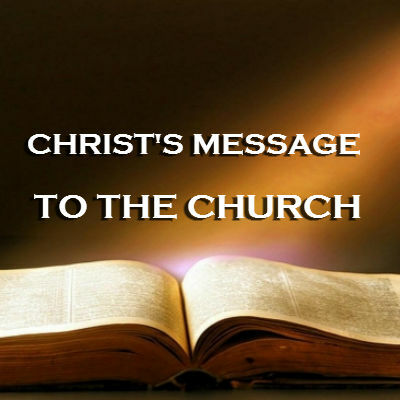 -Christ expects his church to be committed to him throughout the ages. Christ wants a church that is Christ-centered and not self-centered. A self-centered church kicks Jesus from their assembly. Can you imagine a church gathering in which Jesus is not even invited? This is self-centeredness at its best. This makes God sick. Is your attitude making God sick today?